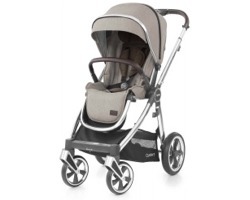 The Babystyle Prestige combines modern style with timeless elegance. With close attention to detail and a large selection of fabric choices the Prestige is available in a wide range of combinations to ensure you get your perfect pram. The carrycot is suitable for babies from birth up to approx 6 months and incorporates many features including rocking rails, a ventilated base and an integral hood air vent. 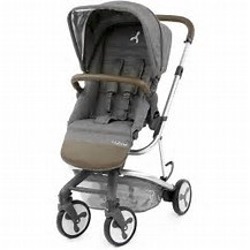 Once your baby has outgrown their carrycot, convert your pram into a pushchair using the fully reclining seat unit, which offers rear or forward facing positions and protection from the elements through the hood and apron. Both seat units can be positioned in multiple configurations to suit your growing family with the seats featuring a three position recline, enabling both babies to fully lie flat or sit up and enjoy the sights around them. Each seat has an integrated insect net and zip-out, fully extendable panel in the hood. The Hybrid Tandem can accommodate two seat units, two carrycots or two infant carriers. 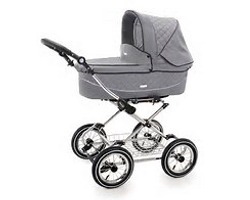 The Babystyle Hybrid City stroller features a high seat unit enabling baby to be closer to you and enjoy the sights around them, telescopic adjustable handlebar ideal for parents of different heights, dual-facing reversible seat unit so baby can face you or the world, and elegant leatherette handle and bumper bar. Oyster 3 Essential Package - The Essential Bundle Package includes stroller, carrycot, car seat, ISOFIX base and multi car seat adaptors. Babystyle Oyster 3 Essential 5 Piece Package has been compiled to give you the best start with your baby. 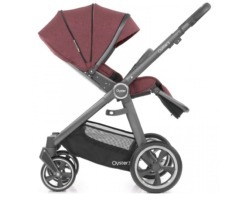 The Oyster 3 is larger, sits higher, has a larger footprint and now takes a 20kg child. Despite this the Oyster 3 has an exceptionally compact fold and a retractable carry handle making it ideal for transporting. Oyster 3 Luxury Package - The Luxury Bundle Package includes stroller, carrycot, car seat, ISOFIX base, multi car seat adaptors, footmuff and changing bag. Babystyle Oyster 3 Luxury 7 Piece Package has been compiled to give you and baby a great start with a super array of Oyster 3 products. 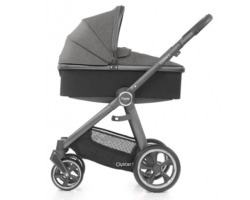 The Oyster 3 is larger, sits higher, has a larger footprint and now takes a 20kg child. Despite this the Oyster 3 has an exceptionally compact fold and a retractable carry handle making it ideal for transporting. Oyster 3 Ultimate Package - The Ultimate Bundle Package includes stroller, carrycot, car seat, ISOFIX base, multi car seat adaptors, footmuff, changing bag, ROCKIT rocker, car seat raincover, parasol, cup holder and lock. Babystyle Oyster 3 Ultimate 12 Piece Package has been compiled to give you and baby everything you could need for a super start in your new adventures together. 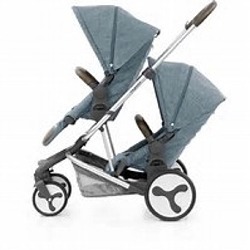 The Oyster 3 is larger, sits higher, has a larger footprint and now takes a 20kg child. Despite this the Oyster 3 has an exceptionally compact fold and a retractable carry handle making it ideal for transporting. • Chassis available in a choice of mirror with black handle, mirror with tan handle or satin black finish. • Multi position, lie-flat seat unit (rear or forward facing). • Narrow lightweight chassis with height adjustable handle. • Lockable swivel front wheels. • Wide range of accessories available in a choice of co-ordinating colours.